A top tip. When out and about in a lightweight configuration, want a massive ammunition loadout and if you want near-perfect accuracy at ranges at 500 yards or more, I recommend the 5.56x45mm aka .223 Remington. If, however, you are at ranges of 100-300 yards and want to knock down your enemy in one shot, I recommend the 6.8x43mm Remington SPC (Special Purpose Cartridge). Ladies and gents, loyal readers of my blog, mates of class and friends of old, today on the blog is one of my favorite topics: Ammunition. 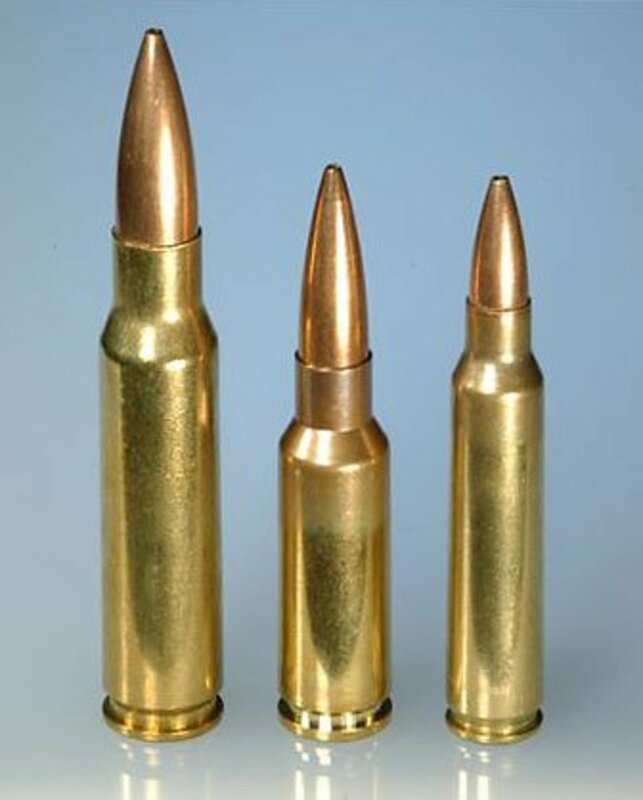 In the 1950's, the U.S. Army was looking to replace the still heavier .308 Winchester (7.62x51mm NATO) which replaced the ageing WWII cartridge, the .30-06 (7.62x63mm). Remington was called by ArmaLite and Springfield to develop a Small-Caliber/High-Velocity (SVHC) bullet from CONARC (Continental Army Command) requirements which ended up being a .222 Remington and a .224 Springfield. Springfield, though, was forced to drop out of the CONARC competition, leaving Remington to make and supply the ammunition. To prevent confusion between the .222 and .224, the bullet was finally renamed to .223 Remington. Which is now the mainstay and backbone bullet of U.S armed forces and armed forces around the world and NATO. 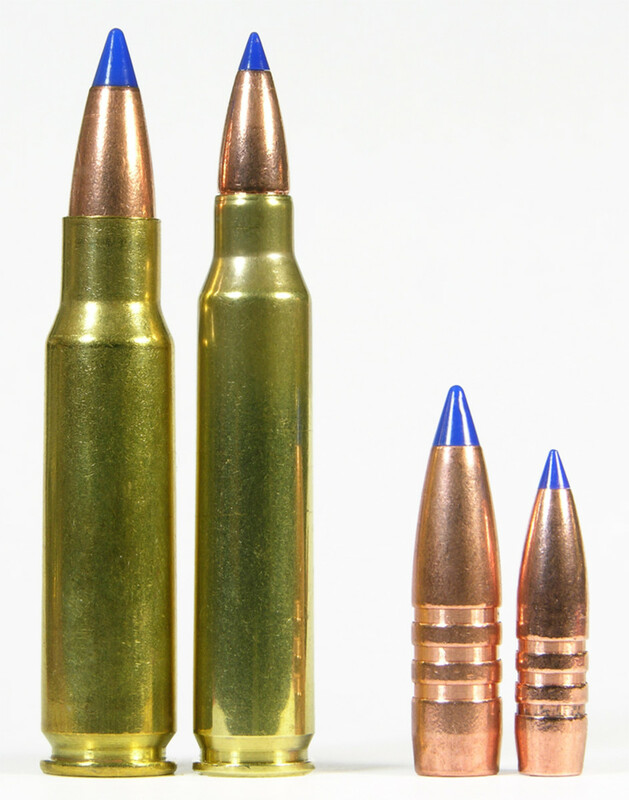 The .223 is now the most widely produced small caliber rifle bullet in the world and rightly so. Just about every country uses it and has been mass produced to the point that just about anyone can buy them over the counter. However, there have been problems since as far back as Vietnam about the bullet's stopping power. As I am an avid fan of modern military weaponry, I'm well versed in guns, their respective ammunition and the limitations that their respective ammunition brings. In Vietnam, for example, on more than one occasion, VC or NVA troopers were shot multiple times and were still miraculously standing and shooting back. On rare occasions, some of them were shot but turned around and looked - looked - at the man who shot them. And they obviously fired back with faces red with rage. You see, the 5.56 is a great and highly accurate bullet, but the relatively small caliber and minute weight mean that, even if you could hit someone with pinpoint accuracy, there just isn't enough kinetic energy or terminal velocity to knock 'em down. The 5.56 is so weak in structure that during the Vietnam war, the bullets would disintegrate if you shot them at or if they were in the way of grass. Grass! GRASS! Now, we go to the 6.8 Remington SPC. First, this bullet is not 6.8mm in diameter. It's only named 6.8 to make it sound sophisticated. It's diameter is actually 7.0mm and the case is not 43mm long. It's actually 42.3mm long. Why it's 43mm long, I have no idea. This bullet was designed to be a possible replacement for the 5.56mm. It's parent case is the .30 Remington cartridge (7.8x52mm) and is sandwiched in between the 5.56mm NATO and the 7.62mm NATO rounds; bridging the gap, as it were. It was developed by Remington Arms in conjunction with U.S. SOCOM (Special Operations Command) for a Short Barreled Rifle (SBR). And was designed to address the deficiencies of the terminal performance of the 5.56x45mm NATO cartridge currently in service with the U.S. Armed Forces. It was to offer superior downrange lethality over the 5.56 NATO/.223 Remington in an AR pattern service rifle with minimal loss of magazine capacity and a negligible increase in recoil. However, the 6.8 is better suited for short barreled rifles or CQB rifles than long rifle configuration. The heavier bullet and smaller powder case prevent long range use of the bullet. Moreover, it performs better at close ranges than the 5.56. The 6.8 SPC round has the same energy at 250 yards as the 5.56mm has at the muzzle. At 600 yards, it has the same energy as a 7.62x39mmR M43 has at 275 yards, M193 at 250 yards and M855 at 375 yards. 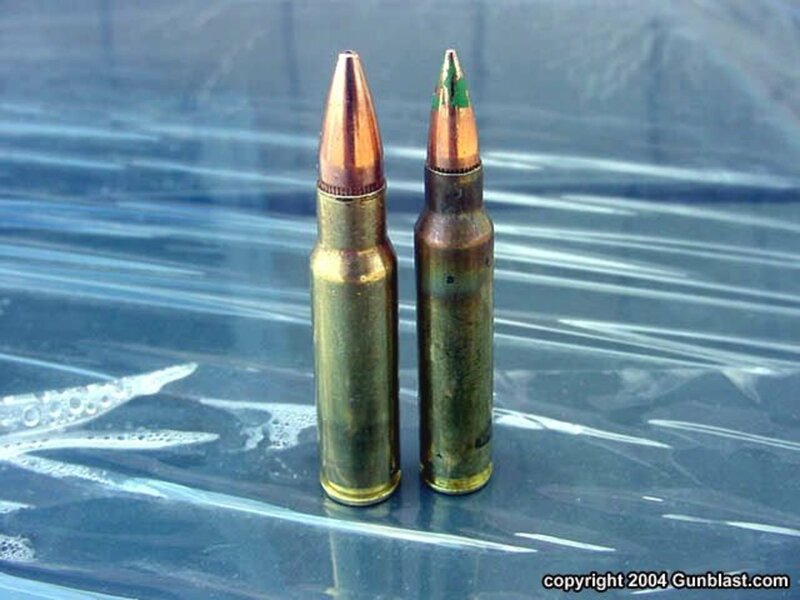 The 5.56mm may also be called the M193 and M855, with different bullet weights. In layman's terms, the 6.8mm has 50% more kinetic energy at 100-300 yards while the 5.56mm has that same energy at point-blank ranges only. (point-blank means ranges within 3-5 yards). At ranges of 500-600 yards, it has 35% more than the 5.56mm. Which bullet would you choose? Choose carefully. Since the 6.8mm is of a larger caliber and contains greater sectional density than the 5.56mm, it will use this energy more effectively when producing terminal damage. Performance can be increased slightly by using 110-grain ammunition, giving you more velocity and less bullet drop over range. The slightly-lower velocity of the 115-grain ammunition combined with more kinetic energy makes this round less susceptible to deflection from soft cover such as foliage, shooting through glass (in the case of vehicle interdictions or bullet-proof vehicles) and body armor. And if you're wondering if upper receivers chambered for 6.8 will fit in 5.56 lower receivers, yes, 6.8mm upper receivers will fit AR lowers, but you will need to change the bolt, bolt assembly, barrel and gas tube and don't forget to use specific 6.8mm mags. And for God's sake watch out for thermal expansion. If you fire 6.8mm SPC ammunition from 5.56mm magazines, the heat that's generated may expand the mags causing stoppages which are life-threatening. The tolerances inside the mag are quite tight because the 6.8mm cartridge is bigger in diameter. Although the caliber is larger, the difference in recoil is theoretically hardly evident and is quite controllable when engaged in rapid fire due to the smaller powder case. Ok, Ok, Ok, the 6.8 will significantly increase your chances of neutralization or incapacitation with a first round strike. It goes without saying that different types of projectiles will produce different results, and that shot placement is still the key no matter what type of round is used. However, it can’t always be achieved, so the introduction of a large caliber that fills the gap between 5.56mm and 7.62mm is vital for the safety of any soldier and is necessary in the fight against terrorism or for personal self-defense and PDW's or Personal Defense Weapons. The 5.56mm can travel up to 3,250 feet per second. That's 990 meters per second. Or about one kilometer per second! Try running that fast and see if your face is still there, why don't ya? The 6.8mm is 91 meters per second slower (about 300 feet per second slower). The difference is discreet and the 6.8mm has more stopping power. The speed and energy are quite fascinating. So, between the two bullets, personally, I'd take the 6.8mm any day. It's got more kinetic energy when hitting the target compared to the 5.56mm. It has more penetrating power versus body armor and reinforced glass. And it has the ability to actually kill in one shot. Although, it's 91 meters per second slower, but come on! Are you going to be more focused on how fast your bullet travels to your target than actually killing your target? The 5.56mm, on the other hand, is overrated. Sure, in the movies like Black Hawk Down and We Were Solders and Act of Valor and Lone Survivor or whatever, it kills in one magnificent shot. But the truth is, soldiers on the front lines have had problems with it since day one and still do even after 60 years. Although, cheap and almost non-lethal, it still is venerable. It's more accurate than the 6.8mm for sure. And it's lighter meaning more ammo to carry. But I've gone on about the advantages of both bullets and their disadvantages. To tell you the truth, if I really wanted to guarantee a one-shot one-kill ratio. I wouldn't take either. I'd take the 7.62x51mm.